Hello! You are a Great Friend! Hiya! Hope you are having a wonderful weekend. 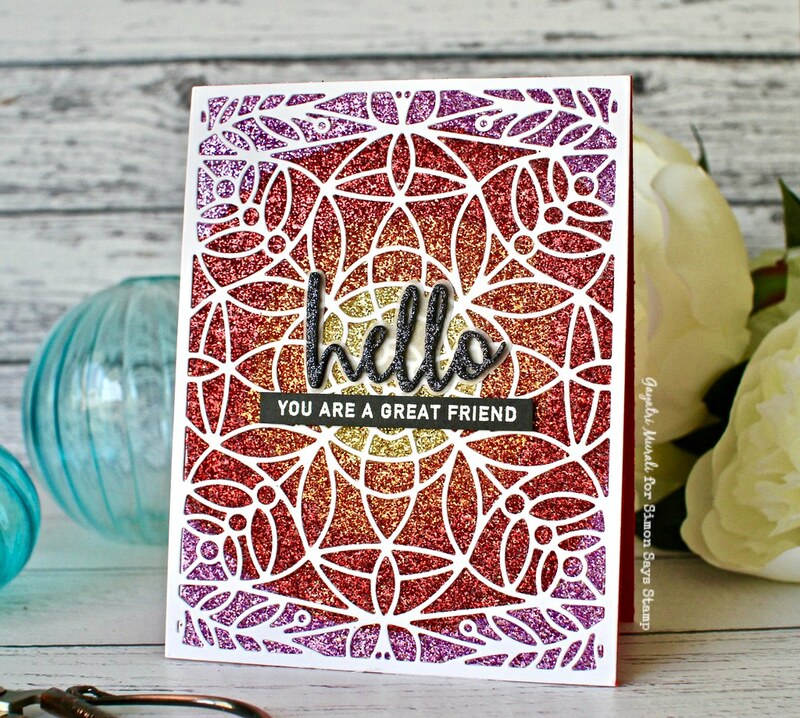 I have another card using Simon Says Stamp Sending Sunshine release products. I have used the new Marilyn full card die here. On the card front, I adhered double sided adhesive. Then I die cut the Marlyn die using white cardstock and adhered on the card front after removing the backing. Then I added the glitters one by one. First I added the gold glitter in the middle and gently burnished it onto the opening with my fingers. Then I added an orange glitter around the gold glitter, again gently burnishing with my fingers making sure there is a good blend between the two colours. I repeated the same process for the red glitter and pink glitter. Finally, put the backing paper back on the card front and using fingers, rub all the glitter into the openings evenly. Then tilt the card and all the extra glitter falls off. I used an old makeup fluffy brush to brush off all the excess. Make sure you are working on a scrap paper on the bottom so you can then scrunch the paper with all excess glitter and throw them away. Then use a swifter cloth to wipe the glitter off your desk and hands. I have saved mine in a jar for future use. 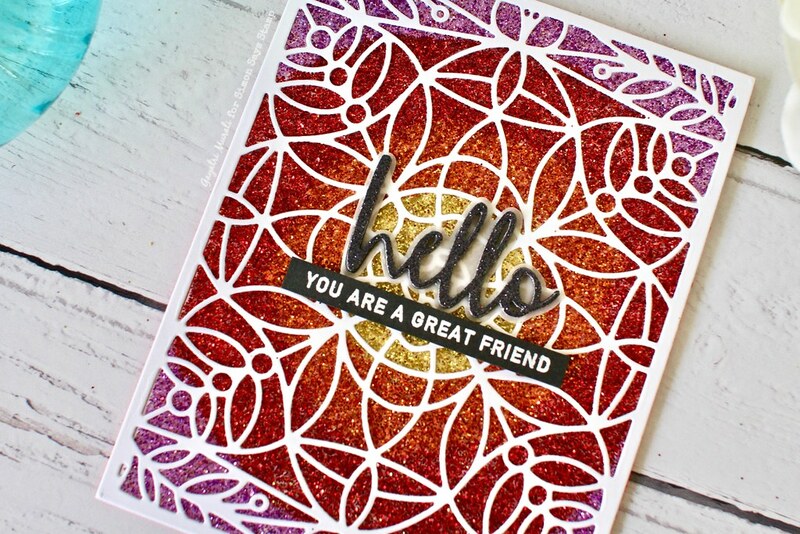 The left over glitter is a mix of all the coloured glitters I have used on the card. All the glitter is so sparkly and beautiful. I then die cut another Marilyn die using white cardstock and layered glued over the one on the card front to get some dimension. For the sentiment, I used Script Hello die from Simon. This is an oldie but a goodie. 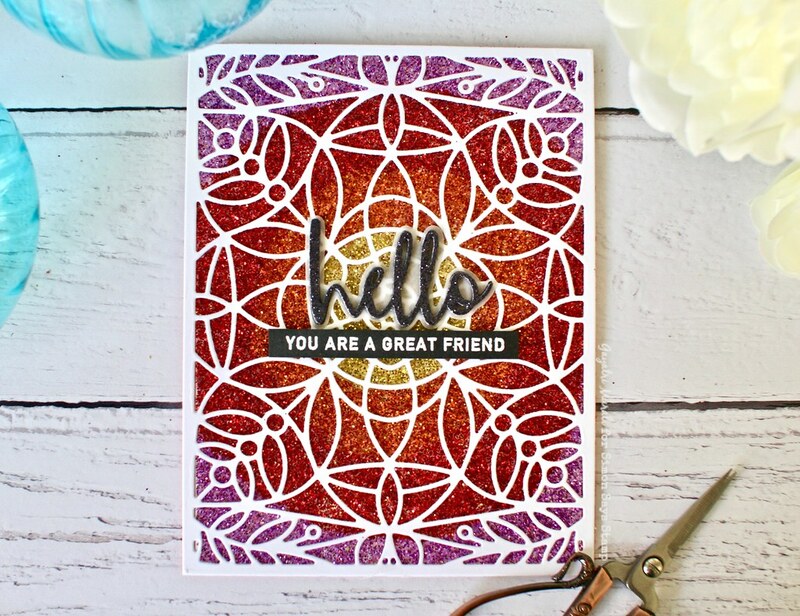 I die cut the hello backer from heavy weight vellum and the hello die thrice. Two using black cardstock and one using black glitter cardstock. I stacked glued all the hello die with the black glitter on top and the backer on the bottom. I adhered this on the centre of the card front. 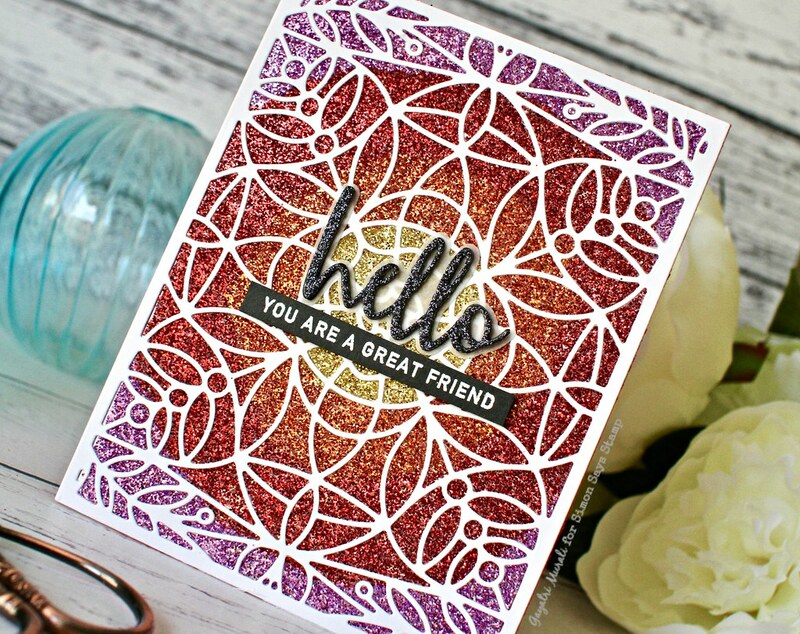 The secondary sentiment is from an older stamp set called You + Me. 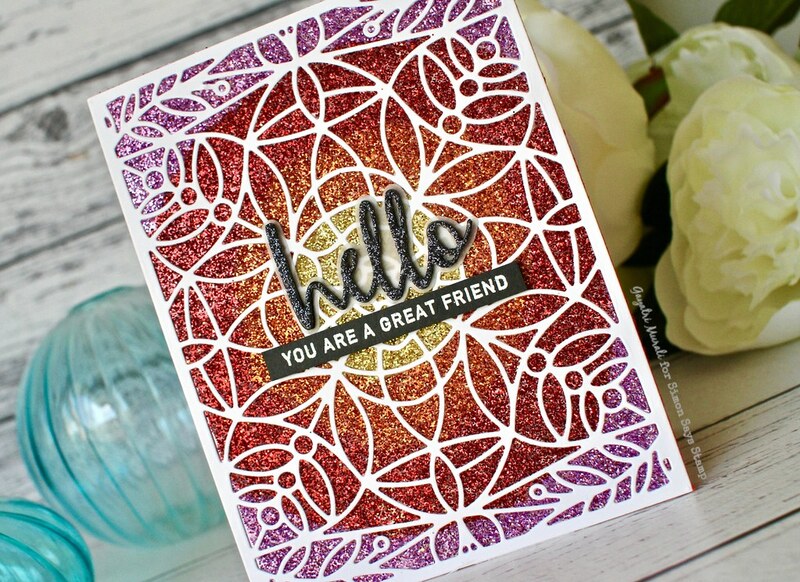 I white heat embossed it on a strip of black cardstock to adhere it on the bottom of the Hello die cut sentiment. No embellishments needed. Thanks so much for stopping by. Have a lovely weekend! Wow, that’s stunning! I love all of the sparkle and shine. That’s not a card, that’s a jewel ! !